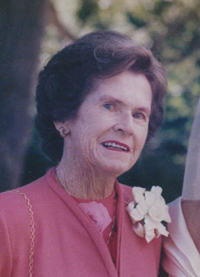 Georgina Squires Gray died peacefully in her sleep on Tuesday, Feb. 11, 2014. She was born Aug. 21, 1922, in Portland, Ore., to Claire Wilcox Squires and Cameron Squires. Growing up outside Portland, she loved the outdoors, especially downhill skiing and ice skating, even considering dropping out of school to skate professionally. Instead, she traveled to New York where she attended the Spence School and Finch College. While vacationing in Santa Barbara in 1950, she met and married Horace Gray Jr., a young attorney and artist. While raising a family and running a catering business in the late 1950s and early ‘60s, Gina was a tireless volunteer. She participated in numerous projects during her longstanding association with the Junior League, volunteered for the Community Chest, Red Cross and United Way, and served as president of the Garden Club of Santa Barbara and, more recently, served several years as treasurer of the Community Arts Music Association Auxiliary board. Somehow she found time to play tennis and attend her weekly Santa Barbara Yacht Club bridge game, which she did for 60 years. In the 1970s, she and Horace began splitting their time between Santa Barbara and Sun Valley, Idaho, where Gina taught cross-country skiing, volunteered at the Ketchum Community Library and became an avid hiker. She shared a love of travel with her two sisters and instilled a wanderlust in her children. After she hung up her tennis racket, Gina joined several more bridge groups, playing five or six days a week, sometimes twice a day. She never corrected a partner or commented on a misplayed hand, but if there was a disagreement, her authority prevailed. Gina will be remembered for her sense of humor, her positive attitude, her graciousness, her calm under pressure, her prowess at the bridge table and her cheesecake. Gina lived a life of integrity and valor. She made friends easily and many of them. She lived life on life’s terms, facing the challenges of aging with grace and dignity. Gina was predeceased by her husband, Horace, and her sisters, Claire Weaver and Josephine Hazen. She is survived by her children, Charles Cameron Gray (Barbara), Katharine Gray DeWitt (Jack) and Susanna Gray Williams (John); step-son, Hod Gray (Laraine); grandchildren, Charlie DeWitt (Molly), Horace Gray IV, Meagan Kemps (John), Erin Guerra (Steve) and Cameron Gray (Joslyn); great-grandchildren, Max Kemps, Fiona Guerra and Jackson DeWitt; and numerous beloved nieces and nephews. A celebration of Gina’s life is being planned for April. Many thanks to all who cared for her in the last few months, especially Dr. Dennis Baker and the caring staff at Samarkand Health Center, and for the loving care she received from her entire visiting nurse/hospice team. In lieu of flowers, donations may be made to Guide Dogs for the Blind or Visiting Nurse/Hospice of Santa Barbara.